Here is a quick #TwoBits* from around the DOC. #DSMA’s New Years New Look: The web site has been overhauled and sports a more user friendly interface. 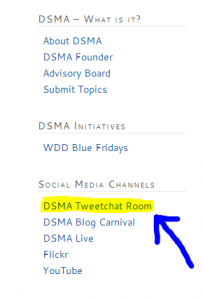 Included in the more friendly part is a menu link to the weekly Wednesday night party that is #dsma chat. More on how to join that party can be found in this post. Carey Potash my favorite blogger at dLife writes about the Medtronic mySentry, its costs and dreaming of a lost poodle. If Carey isn’t in your RSS feed adding him is a great New Years resolution. You will thank me I’m sure.